4 137.5 / 2 Omaha Beach Richard Mandella Mike Smith 1st in G1 Arkansas Derby Looked on “Cruise Control” in Arkansas Derby Win / Wow? 5 60 / 12 War of Will Mark Casse Tyler Gaffalione 9th in G2 LA Derby Worked Out of Gate at Keeneland / Can He Overcome LA Derby? 8 70 / 10 Haikal Kiaran McLaughlin Rajiv Maragh 3rd in G2 Wood Memorial Has a Solid Late Run / Can He Use It in Lou? 11 65 / 11 Improbable Bob Baffert Jose Ortiz 2nd in G1 Arkansas Derby Like His Grit, but a Son of City Zip in at 11/4-Miles? 14 38 / 22 Signalman Ken McPeek Brian Hernandez 3rd in G2 Blue Grass Stakes Ran Better in 2nd Start Off Layoff / Can He Move Forward? 18 30 / 26 Instagrand Jerry Hollendorfer Flavien Pratt 3rd in G1 SA Derby Distance Now Becomes A Concern / 3rd of a Layoff? 19 40 / 19 Spinoff Todd Pletcher John Velazquez 2nd in G2 LA Derby Can He Add Distance to His Game? The preps are now done. The points have been tallied. The field for the 145th Kentucky Derby seems to be set — for the most part. There is so much confusion. There is so much debate. There is so much to be decided. Oh, the top horses seem to be pretty much set, although one could debate whether one should be considered better than another. Is Game Winner, who won over the Churchill Downs’ main track last November to capture the Breeders’ Cup Juvenile, better than his last two second place finishes to Omaha Beach, and Roadster? Is Tacitus, winner of the last two in a row, better than any of the above? Is War of Will’s rear end better now, and ready to overcome his side-swipe run in the Louisiana Derby? Is Code of Honor better than his third in the Florida Derby? Is Haikal and Tax — and the Wood Memorial — better than people give them credit? But the thing that makes this year’s field for the Kentucky Derby such a debate — at least in my mind — is that 5 horses that are on our own “Others List” are likely to make their way into the starting gates for the world’s most prestigious race. And, by virtue, 5 horses that we think are much better in their performance levels and are included in our “Top 20” list could be looking from the outside and hoping just to wedge their way into the Top 20 before May 4. That’s .25% of the field. So, in one way, we are sorry that some of “our” main contenders won’t get a chance to show their wares in this year’s Derby, we are now able to concentrate more on the ones that we think are at the top of this year’s pecking order. Anothertwistafate, second in the G3 Lexington Stakes this past Saturday and #7 on our top KY Derby rankings list, will not get in, unless there are some serious defections. Currently, he sits at #23 on the list. Bourbon War, fourth in the G1 Florida Derby in his last out, currently is at #25 in the points category, and is seriously doubtful now to make this year’s field. We have loved this son of Tapit all Spring, and we think he would be a tough out in this year’s “Run for the Roses.” We have him #9 in our standings. Signalman, who has had an up-and-down Spring for trainer Ken McPeek, looked like the old self in running third in the G2 Blue Grass Stakes in the last out, and he ran very well at Churchill Downs in the Breeders’ Cup Juvenile last November, too. But he is at #22, and currently on the outside — casting a wistful eye. And, there is both Sueno and Instagrand — neither of whom are likely to make this year’s field. We thought they could add some punch and pizzaz to the party. But make no mistake. This year’s field certainly has some quality to it. Is it deep and wide? Roadster remains at the top, coming off an impressive win in the Santa Anita Derby, when he “woo-shed” past the game Game Winer in the stretch to pull away at the wire. Since coming back from his throat surgery, Roadster — a smaller body type than some of Bob Baffert’s latest racing monsters — is undefeated and starting to fulfill the promise that he showed the barn experts as a 2YO last summer. Game Winner remains at the top, 1A, coming off his second in the Santa Anita Derby. This guy started the year undefeated and the 2YO champ. Now, after a nostril loss to Omaha Beach and a premature run in the Santa Anita Derby, the glamour seems to be lost. I would not be so dismissive. He has a win over the track where the KY Derby is contested. He has a running style that has performed well in recent Derbies — as a stalker. And, he has a trainer known for pulling off May Magic. Tacitus looks to be the most improved horse on the year, coming off back to back wins — including a nice rail-skimming win in the Wood Memorial. And, there is Omaha Beach. He looked to be in absolute cruise control in the Arkansas Derby — dispatching all rivals, including Baffert’s third Derby hopeful in Improbable. 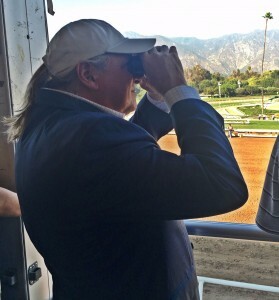 What horse will Hall of Famer Mike Smith pick to rider in The Derby? Will it be Roadster? Will it be Omaha Beach. Another question in this year’s Derby Drama. No matter who gets into the starting gate on the “First Saturday in May,” it will be thrilling.